There are many programs that can help us to download all kinds of files from Internet, but few of them help us to organize our music collection at the same time that we expand it. Music Tuner is a tool from which as well as playing any track, we can organize our library, create playlists and edit ID3 tags, we will be able to download any song or video from YouTube, thus expanding our music collection. 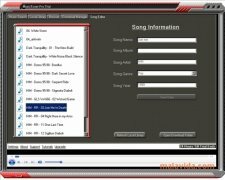 We will only need to make a search from the application and select the songs that we want to have on our computer, as soon as we do this, MusicTuner will start to download them to the folder that we have previously selected for this purpose. If you still don't have an application with which to keep your music collection organized, that allows you to prepare playlists, that will also allow you to expand it, don't think twice and download MusicTuner to discover an application that is different from the rest.